She was attacked by two Super Etendards which fired French-built Exocets like the ones that sunk the Coventry’s sister ship HMS Sheffield on 4 May. Two Oerlikon 20 mm cannons. Two STWS Mark 2 torpedo tubes, two chaff launchers. The principal role of these ships was to provide the fleet with mid-range anti-air warfare capability with secondary roles of anti-surface and anti-submarine. A total of sixteen Type 42s were built between 1972 and 1985, in three batches, with Coventry the last of the first batch to be commissioned. To cut costs, the first two batches had 47 feet removed from the bow and the beam-to-length ratio reduced. These early Type 42s performed poorly during trials and were notoriously poor sea-keepers. 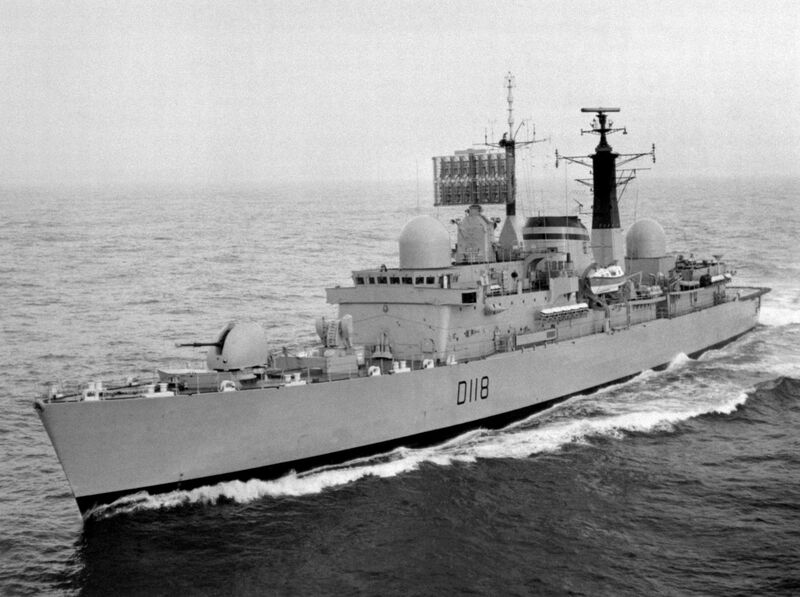 Coventry was commissioned on 10 November 1978 under the command of Captain C. P. O. Burne at Portsmouth. Following post-commissioning trials, the ship was used to trial the operation of the new Westland Lynx helicopter from the Type 42 platform, to test the combination’s safe operating limits. The ship’s first major deployment came in 1980 when she was sent to the Far East; in September of that year, alongside Antrim and Alacrity, she became the first British warship to visit the People’s Republic of China in 30 years. 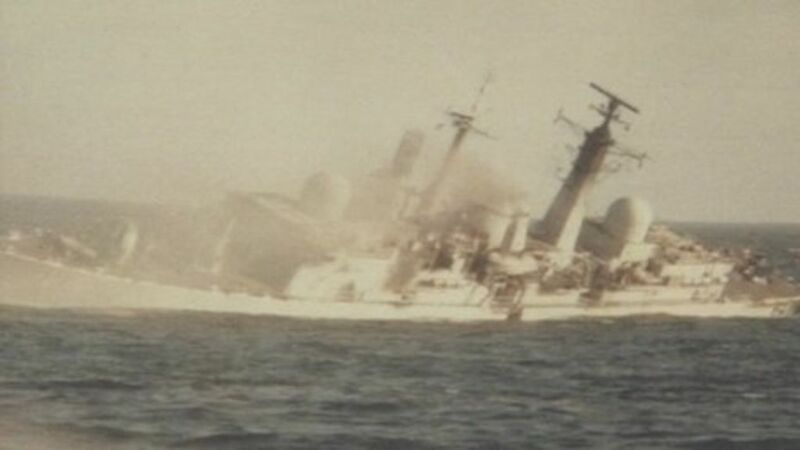 En route back to the UK, Coventry was diverted to the Persian Gulf following the outbreak of the Iran–Iraq War, where the ship remained on patrol for six weeks until relieved by the start of the permanent Armilla patrol consisting of Ardent and Apollo. Throughout 1981 and into 1982, Coventry took part in various exercises in home waters, culminating in her deployment as part of Exercise Springtrain ’82 in March 1982. Coventry was taking part in the Exercise Springtrain 82 near the British base of Gibraltar, during March 1982. Along with other vessels involved in the exercise she was detailed for service in the Falklands Campaign. She had a Union Flag painted on the roof of her bridge and a black line painted through her funnel to her waterline to aid recognition, as the Argentines also operated two Type 42 destroyers. 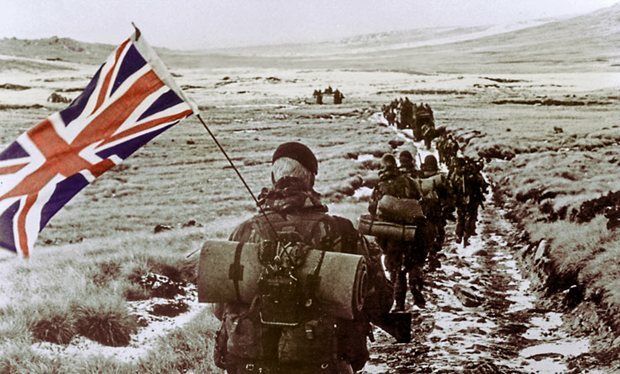 On 27 April, Coventry, in company with Glamorgan, Glasgow, Arrow and Sheffield, entered the Total Exclusion Zone, a 200-mile cordon around the Falkland Islands. Alongside Sheffield and Glasgow, Coventry would form the air defence vanguard for the aircraft carriers following behind. Coventry‘s contribution to the Falklands War was considerable. Her helicopter was the first to fire Sea Skua air-to-surface anti-ship missiles in action. Her Westland Lynx HAS.Mk.2 fired two Sea Skua missiles on 3 May at ARA Alferez Sobral, the former USS Salish. One missile missed and the other hit a small boat, knocking out the radio aerials and slightly injuring a crewman manning a 20 mm gun. Glasgow‘s Lynx fired two more Sea Skua, and the vessel retreated, with eight crew killed, eight wounded and heavy damage. Her damaged bridge is now on display at the Naval Museum in Tigre, Argentina. The vessel remains in service in the Argentine Navy. Published in El Clarín. The circle with the “1” is where General Belgrano was sunk. The “2” shows the last contact with Alferez Sobral. one on the northwest side of the cliffs, the other in shallow waters on the southwest. Lt Casco and Lt Farias were both killed. Following the loss of Sheffield, a new air defence tactic was devised to try to maximise the task group’s remaining assets. This saw the two remaining Type 42s paired with the two Type 22 frigates (a pairing unofficially termed Type 64) and deployed much further ahead of the main force in an effort to draw attacking aircraft away from the carriers. At first, the trap worked, with FAA A-4B Skyhawk C-244 of Grupo 5 shot down north of Pebble Island by a Sea Dart. Pilot Capitán Hugo Ángel del Valle Palaver was killed. Later a FAA A-4C Skyhawk coded C-304 of Grupo 4 de Caza deployed to San Julian was shot down north east of Pebble Island by another Sea Dart while returning from a mission to San Carlos Water. Capitán Jorge Osvaldo García successfully ejected but was not recovered from the water. His body was washed ashore in a dinghy at Golding Island in 1983. Garcia’s wingman, Teniente Ricardo Lucero, was also shot down during the raid on San Carlos by a Rapier Missile from ‘T’ Battery, 12 Regiment Royal Artillery, but he was luckier, and ejected into captivity, in front of waiting news crews. The two ships then came under attack by two waves of two Argentine A-4 Skyhawks. The first wave carried one 1,000 lb free-fall bomb while the second one carried 3 x 250 kg bombs. The four Skyhawks flew so low that Coventry‘s targeting radar could not distinguish between them and the land and failed to lock on. Broadsword attempted to target the first pair of attackers (Capitán Pablo Carballo and Teniente Carlos Rinke) with her Sea Wolf missile system, but her own tracking system locked down during the attack and could not be reset before the aircraft released their bombs. Of the bombs released, one bounced off the sea and struck Broadsword‘s flight deck and, though it failed to explode, wrecked the ship’s Lynx helicopter. Coventry claimed to have hit the second Skyhawk (Capitán P. Marcos Carballo) in the tail with small arms fire, although the aircraft returned safely to Argentina. In fact, Carballo’s plane was hit under the right wing by a piece of shrapnel on his way in, that pierced his aircraft’s right fuel tank. The second pair of Skyhawks (Primer Teniente Mariano A. Velasco and Ensign Alférez Leonardo Barrionuevo), headed for Coventry 90 seconds later at a 20-degree angle to her port bow. Still unable to gain a missile lock, Coventry launched a Sea Dart in an attempt to distract them and turned hard to starboard to reduce her profile. On Broadsword the Sea Wolf system had been reset and successfully acquired the attacking aircraft, but was unable to fire as Coventry‘s turn took her directly into the line of fire. Coventry used her 4.5-inch gun and small arms against the attacking aircraft. The port Oerlikon 20 mm cannon jammed, leaving the ship with only rifles and machine guns to defend herself. Coventry was struck by three bombs just above the water line on the port side. One of the bombs exploded beneath the computer room, destroying it and the nearby operations room, incapacitating almost all senior officers. The other entered the forward engine room, exploding beneath the junior ratings dining room where the first aid party was stationed, and the ship immediately began listing to port. The latter hit caused critical damage as it breached the bulkhead between the forward and aft engine rooms, exposing the largest open space in the ship to uncontrollable flooding. Given the design of the ship, with multiple watertight compartments, two hits virtually anywhere else might have been just survivable. The third bomb did not explode. Within 20 minutes Coventry had been abandoned and had completely capsized. Coventry sank shortly after. Nineteen of her crew were killed and a further 30 injured. One of the wounded, Paul Mills, suffered complications from a skull fracture sustained in the sinking of the ship and later died on 29 March 1983; he is buried in his home town of Swavesey, Cambridgeshire. Broadsword subsequently rescued 170 of Coventry‘s crew. No member of Coventry received an award for bravery. CPO Aircrewman M J Tupper of No.846 NAS was awarded a Distinguished Service Medal for his part in the rescue. After the war, a cross to commemorate crew members who lost their lives was erected on Pebble Island. 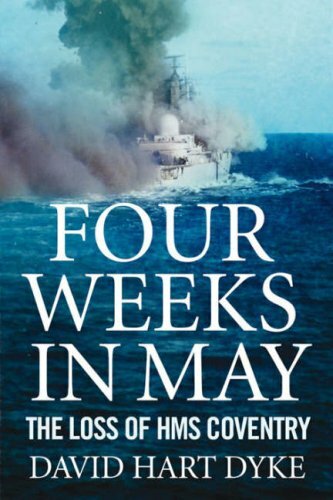 David Hart Dyke, Coventry‘s commanding officer during the Falklands War, wrote about the ship’s tale in his book Four Weeks in May: The Loss of HMS Coventry. This was adapted by the BBC into a documentary Sea of Fire, with dramatised sequences and shown in June 2007. In 2011 it was announced that a feature-length film would be produced based on Four Weeks in May, to be written and directed by Tom Shankland. The documentary television series Seconds from Disaster featured the attack on the Coventry in the episode “Sinking the Coventry” in December 2012. The wreck site is a controlled site under the Protection of Military Remains Act. Five months after Coventry sank, a RN Fleet Diving Team conducted an underwater survey of the wreck, which they found lying on her port side in approximately 100 metres (330 ft) of water. This survey was the beginning of “Operation Blackleg”, a series of dives to recover classified documentation and equipment and to make the remaining weapons safe by means of explosive demolition. The dive team recovered several personal items belonging to Hart Dyke and other officers along with the ship’s battle ensign, later presented to the next Coventry, a Type 22 frigate. The divers also recovered the Cross of Nails, originally presented to the ship by Coventry Cathedral. This too was loaned to the new Coventry, until her decommissioning in 2002, when it returned to the cathedral. The Cross is now carried on board HMS Diamond (D34), a Type 45 destroyer. There is a memorial plaque to the dead of HMS Coventry at Holy Trinity Church, Coventry.